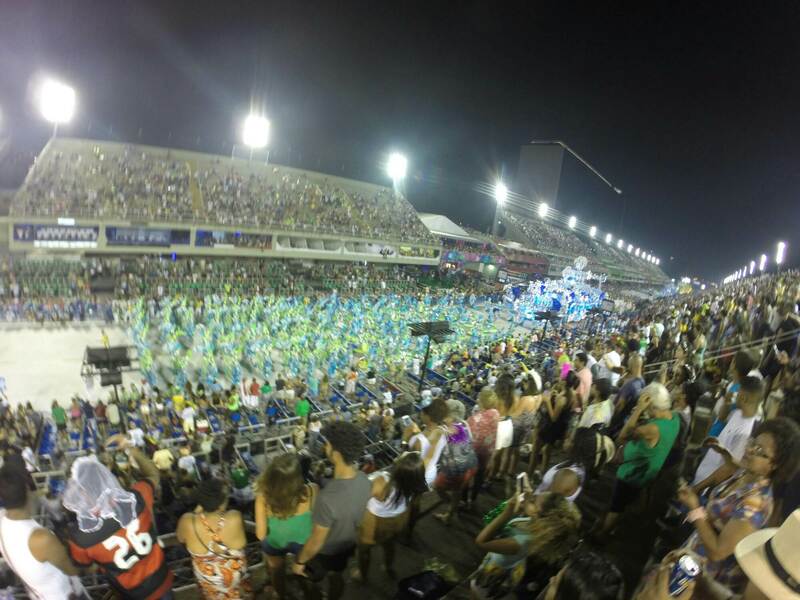 ​​The craziness that is Carnival (spelled “Carnaval” in Portuguese) in Rio De Janeiro was our next stop, and from what we had heard it was going to be wild. 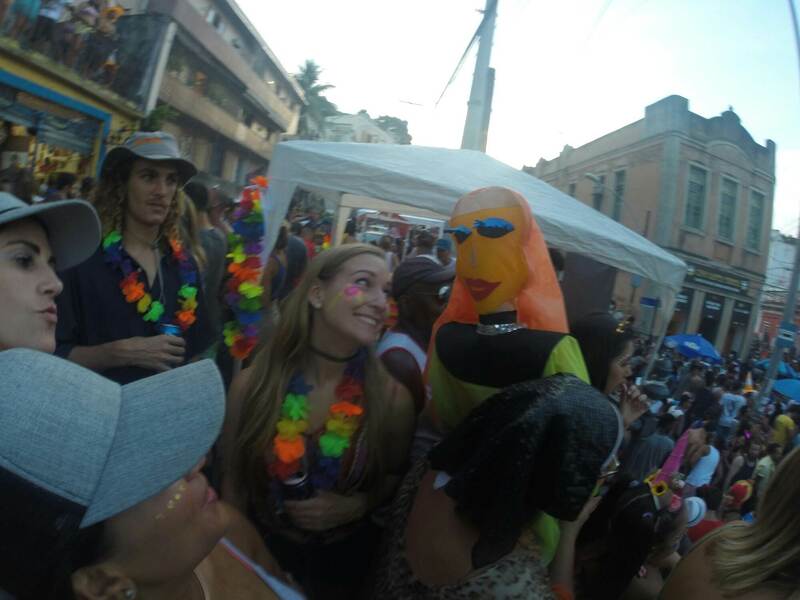 Every Brazilian we told of our Carnaval plans in Rio gave us this strange smile of excitement and fear for us, all saying it would be so much fun – but so hectic. I really wasn’t sure what to expect, was I going to be able to handle the 5 days of straight drinking? The lack of sleep? And of course, the thousands of people crammed into small streets! We stayed in the area of Santa Teresa which we presumed was going to be an average neighbourhood to stay (and the best we could afford due to inflated hostel prices), but as the date got closer we kept hearing from Rio locals that the best blocos (street parties) were avtually in Santa Teresa and that Ipanema and Copacabana were overrated. This was good news as we were only a few hundred meters from the start of the Santa Teresa blocos, meaning we didn’t have to worry about navigating the busy metro to go to other neighbourhoods everyday. 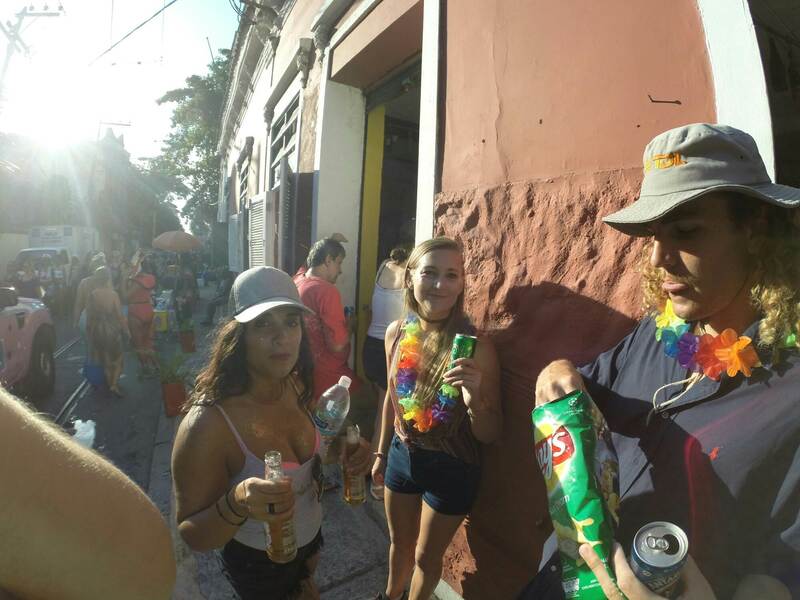 From the minute you hit the streets you can feel the vibe, hundreds of people making their way up the hills of Santa Teresa all dressed up like it was Halloween. Some people have eskys of beers and others were trying to drink some last minute water before the drinking begins. As we made it to the start of the bloco we could hear the local bands playing and as we followed the sounds the crowd got bigger and bigger. Street vendors flooded each side of the street selling beers and food screaming out to make a sale. It’s almost impossible to get to the band as people continue to push through as the band walks the streets so we settled for a spot about 20m back and followed the music taking in all of the craziness going on. The atmosphere is amazing and people are so friendly, everyone is just out to have a good time. The parade marches through the streets with people enjoying the party from there balconies, some even using hoses to spray down the sunburnt crowds. As the party marches on and on you think “it’s all coming to an end” you then meet another bloco and the party just keeps going! The next morning we woke up thinking “how are we going to do another 4 days? !” I think it is essential to mention that the first bloco party we had planned for the day started at 7am so it was a beer kinda breakfast. This is something we made a habit over the next few days and not something you should try at home! Over the course of the 5 days we ventured out to other blocos and found the best ones are the smaller ones. 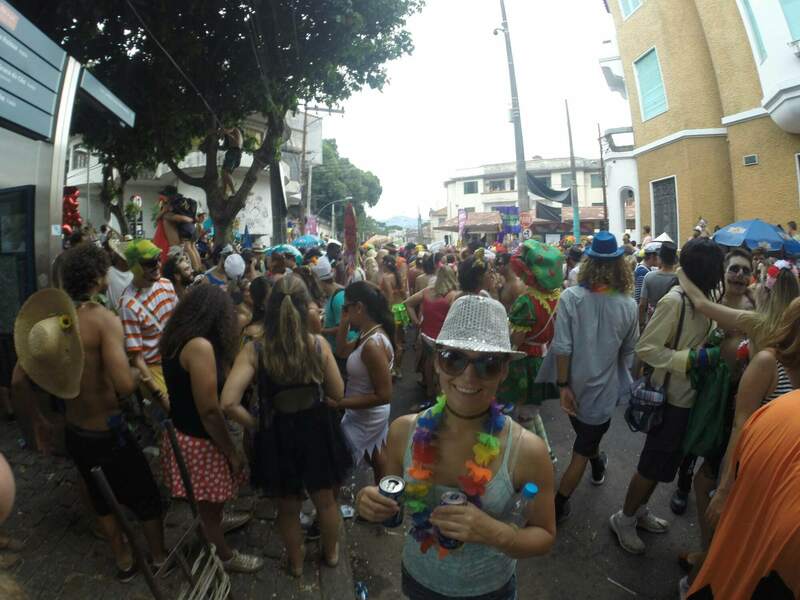 The crowds at places like Ipanema are so big it’s impossible to get near the music and you end up in crowds of people just standing around drinking, hardly the true experience of carnival. Speak to some locals and ask them about the best blocos, with hundreds on offer its impossible to know which ones to go to. We were lucky enough to have met lots of locals before hand and had a nice list to choose from. One of my favourites was the Beatles memory bloco located near Gloria station. It was more like a festival than a street party as it was based around a stage (as compared with the walking bands), it was nice to be able to dance and enjoy some music without pushing through crowds! When you head to Rio for Carnaval you absolutely must go to the Sambadrome – and don’t worry about which night you go, it’s all amazing! I’m not even into dancing but the colors and dancers put on some of the most amazing performances. The costumes are really a work of art, it really shows how much time goes into the parades. It is an experience that is so different than anything I’ve ever seen before, it’s nearly impossible to describe with words and pictures – you must just go for yourself. If there’s one thing you need to be prepared for it’s all the sweat you will have rubbed all over you from the tightly crammed crowds enjoying the party. Don’t wear your nicest shirt unless you want a smelly souvenir to take home with you. Other than that, it’s pretty safe on the streets from what we saw, most people are just party goers enjoying the parades and vendors trying to make a living. We didn’t hear of any problems nor experience any (and the only time we felt unsafe was in Ipanema in one area of the bloco), if you keep your wits about you and are with a good group of people, guarenteed you will have fun!